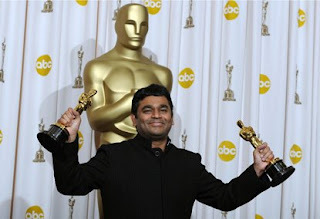 Great news for indian music lovers.A.R.Rehman got OSCAR for his music to Slumdog Millionaire.It's a great honour to Indians & Indian music.I felt really proud when he got award for his music.But I think its too much late that he got recognised after long time at international podium.I think he is magician.I love his music because it gives life and identity to movie.I recognise him for the first time when I heard ROJA song "choti si aasha".That time i saw his interview on TV.He is the first musician I knew.Then I followed his music up to day. I love his music in Rangeela,Bombay,Pukar,The legend of Bhagatsingh,Rang de Basanti,Jaane tu and lots of.But especially The legend of Bhagatsingh & Rang de Basanti are my favourites. I wish all the best & god will make him to create the love through his music.